​Kids love music. That’s just common knowledge. The truth is that there are certain musical instruments you have to have when you’re a kid, but it can be hard to figure out how to adapt them all for every age group. Older kids might be ready to get their hands on actual musical instruments while younger kids who show an interest in music aren’t yet mature enough to handle the real thing and musical toys may not be right for developing their skills. Is there a way that kids of any age can get their hand on the instrument essentials they love? Believe it or not, there are many awesome things available for any kid at any age, no matter what instrument they prefer. From a busy toddler to a moody teenager, we’ve broken down some of the essential instruments kids should love and found some of the best ways to introduce them to various age groups. Check it out! 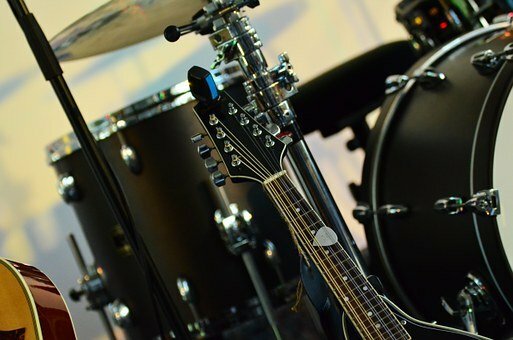 Drums are an essential part of any band because they keep the best drive the rhythm. In fact, the other members of the band rely on the drummer to keep an even pace so that they have something to rely on. There are different drums for different ages but it’s safe to say that, when it comes to music, a drum is nearly always essential. 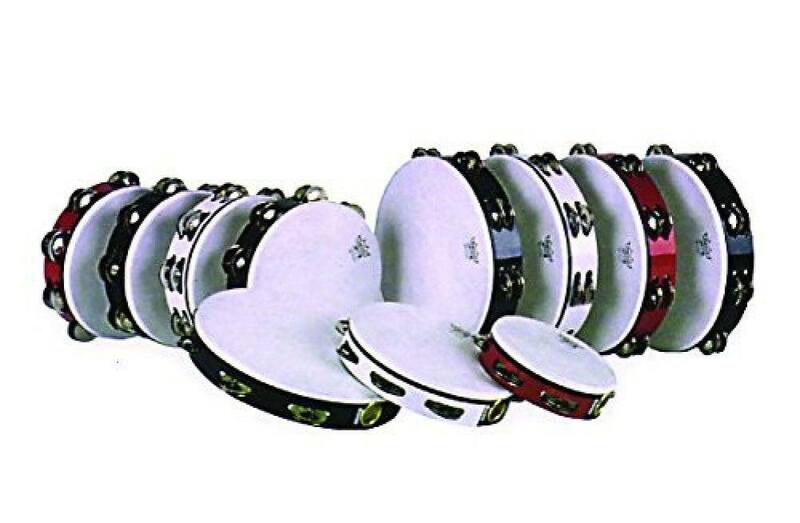 There are so many different kinds of drums, too, that it’s easy to find one appropriate for any age group. 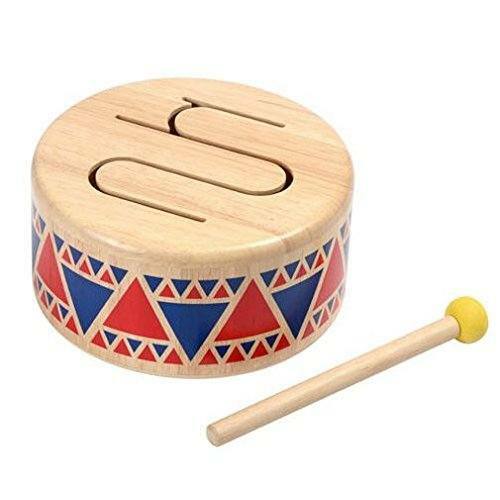 If you expand into percussion instruments in general, you get even more great options! When it comes to drums, kids in this age range don’t need anything too involved. If you hand a toddler a drum, chances are she’s going to know exactly what to do with it. Look for something they can bang and hit to make some noise and work on their hand-eye coordination with. It doesn’t even need to have drumsticks. There are durable plastic ones available from popular toy makers or you can find some really nice ones that are made out of wood. In this age group, kids have a little more coordination and a better understanding of what a drum is really for. They’ll be able to copy simple rhythms and even create some of their own. Try something a little different, like some bongos! 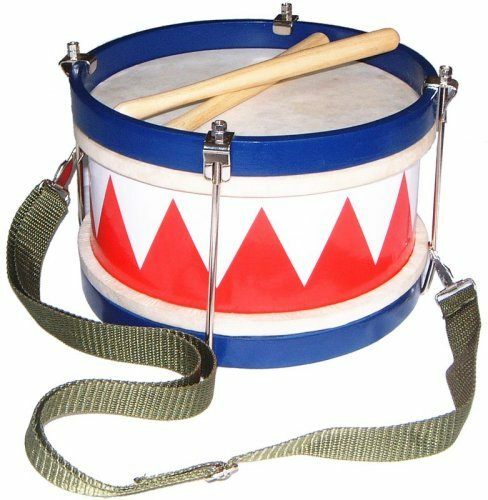 Or, maybe a tunable drum is ideal for something a little more realistic. Feel like your kid is ready to go all in? Try an age appropriate drum set. Once kids hit this age, they’re ready for more realistic stuff. A drum set is perfect for this age group. 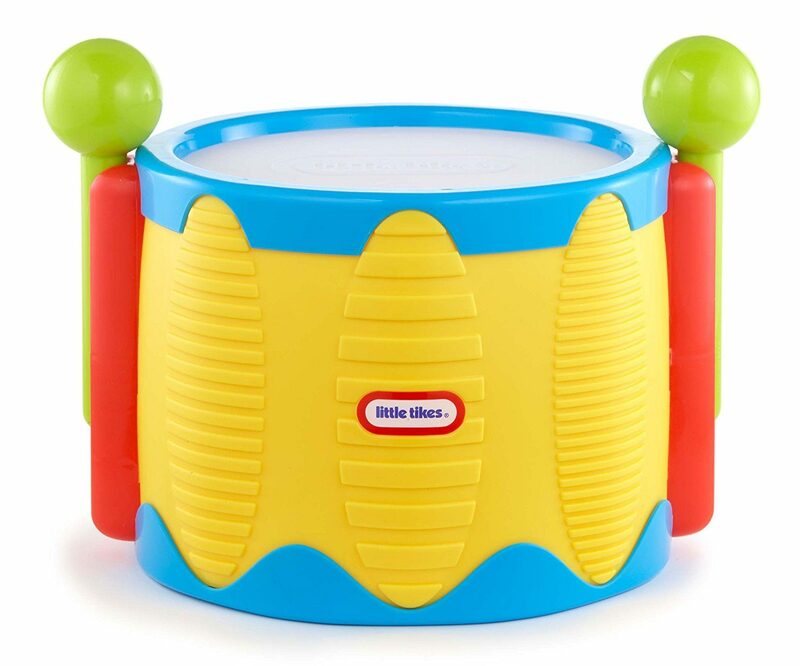 Of course, as they get older, you may want to think about a real drum set that lets them begin to learn how to use their feet in conjunction with their hands on their way to becoming a master percussionist. Alternatively, think outside the box! Try a steel drum or bring in some other percussion. Maybe a tambourine or hand drums. Children this age are obviously not going to be able to use conventional guitars with strings. That said, you can introduce them to the idea of a guitar even at this young age. 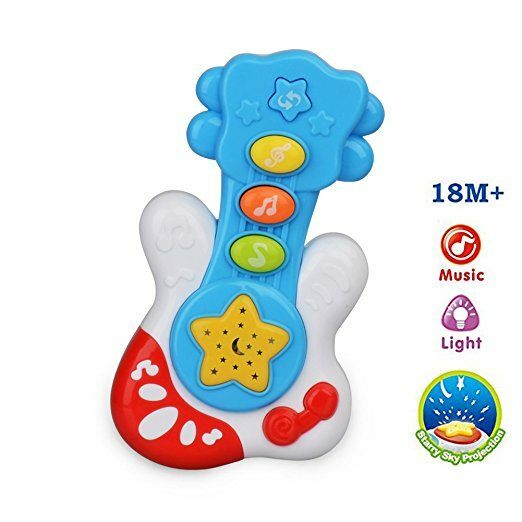 You can find toy guitars that l﻿i﻿ght up and play classic melodies, tie into their favorite cartoons, and even act as a nightlight. When they’re this young, the goal is really to have fun and give them an outlet if they have musical ability. Of course, the television tie-ins will continue into this age group, too. You can also find cartoonish versions that are great for a funny song and a laugh. 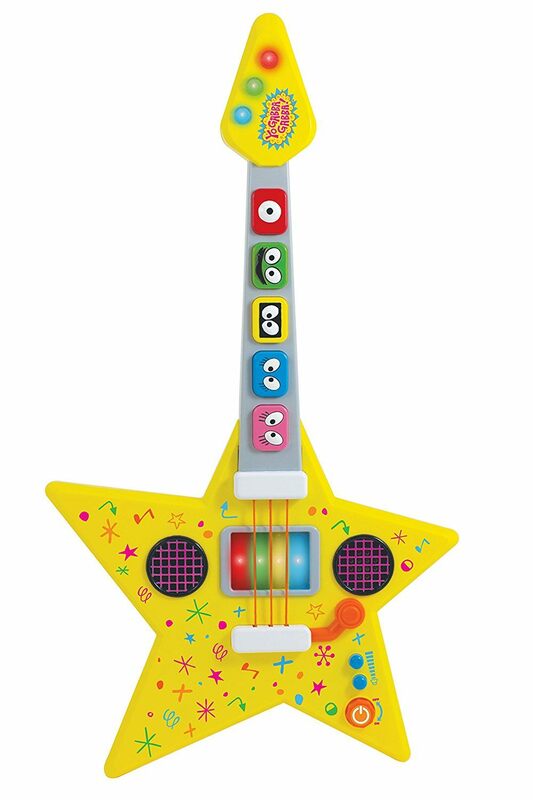 These are age-appropriate ways to learn about the guitar but when a kid is ready, there’s no substitute for a real guitar. If your child is at the older end of this range and ready to take on the real thing, there are half size guitars available so they can learn to play the right way. Not quite ready for a guitar? How about a ukulele? By the time kids are this old, they’re ready for the real thing. A half-sized guitar is an option here, too, especially for smaller, younger kids. Want something a little more grown up? Try a ¾-size electric guitar. Of course, there are also plenty of full-size guitars available if your child is ready. You can also really amp it up a notch with a kid-sized electric bass guitar. Playing the piano is a great way to see how rhythms and melodies come together. Because you’re playing both, you can better understand how things progress and harmonize. While one hand plays the treble clef, the other sticks to bass and the whole arrangement come together. Of course, not all kids will be ready to sit down at a full-sized piano right away. Don’t worry! Each age group has its own appropriate options. There are a lot of options for pianos even with this age group. There are some that are more toy-like than others. 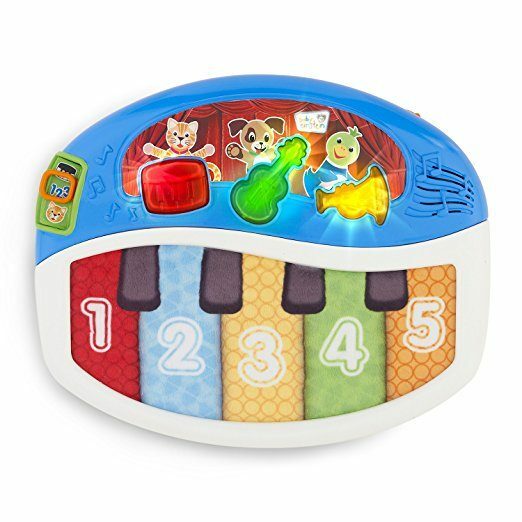 If you want a toy-like piano just to get your child interested, that’s great! If your little one is ready for something resembling the real thing, you can find baby grand pianos even for your toddler. Toy baby grands are a great fit for this age group, too, but you might find they’re ready to move on to something a little different. Try a keyboard or an electric piano. 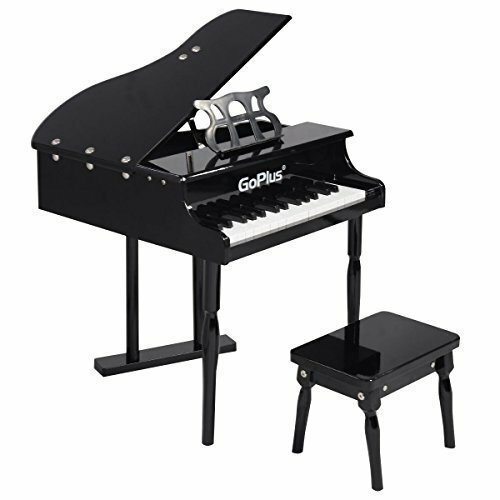 It should come as no surprise that there are even kids’ pianos that are compatible with your tablets and smartphones. Older children are ready for real pianos or at least something resembling real pianos. 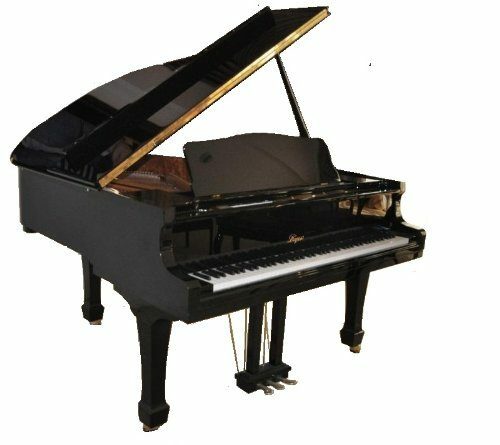 If you don’t have room in your house or budget for a full-sized piano, there are a lot of good options. 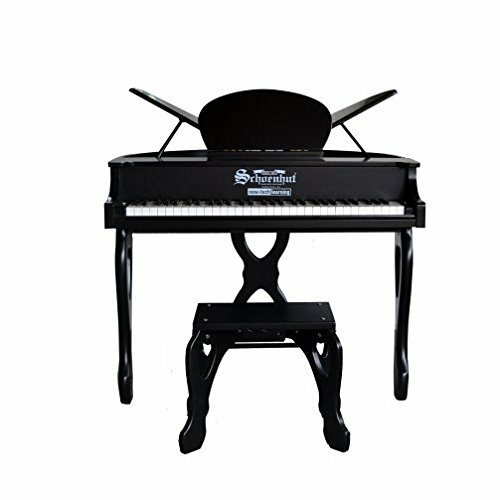 Electric pianos are amazing and come with full-sized keys and can be integrated with all kinds of technology. You can even find some with 88 keys and a bunch of cool accessories. There are digital uprights, too, which is an affordable full-sized option. Of course, you always have the option to go all in on a real piano or splurge on a baby grand. Violins are important in symphonies and a key sound in most classical music. The violin in a great stringed instrument to start with for kids interested in stringed instruments because it can set the groundwork for kids to learn other, too. The cello, viola, or double bass are all in the same family as the violin. And, yes, there are actual violins made for even the smallest kid hands! 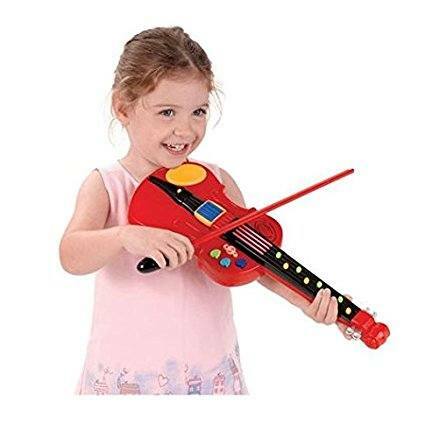 Want to get your kid started on the violin while still young? There are some that are as small as 1/64 of an adult-sized violin that is appropriate for toddlers. It’s likely that children at this young age group would have more fun with a toy and, of course, there are actual toy violins as well. 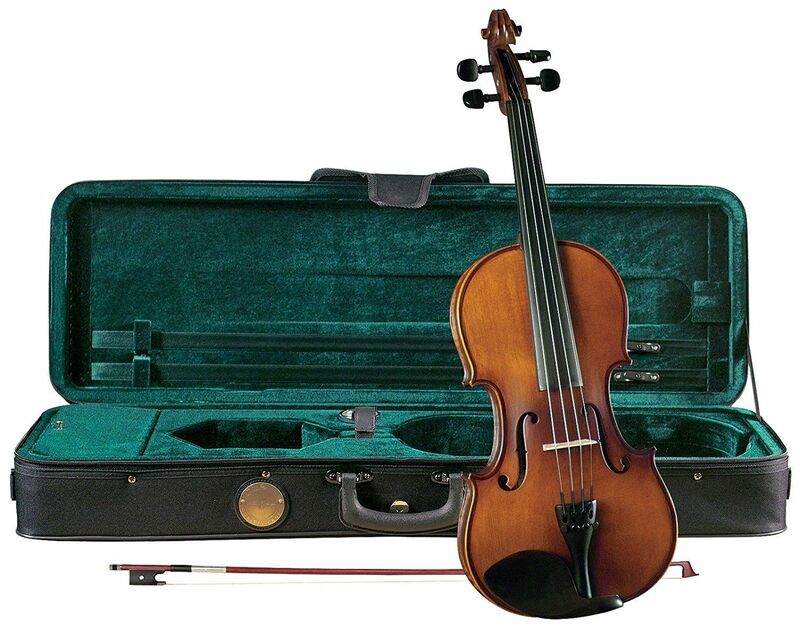 There are some violins available to young kids that are ⅛ the size of a full sized adult one. Some of them even come with all you’ll need to help your kid start to play. You can actually find a lot of variety in size and color so you’re sure to find one that your kid will like to play. Finding the right size is important at this age. If it’s too small or too big, the child might get frustrated and want to stop playing. For the younger children in this age range, narrowing down the right size and color is the easiest way to get them a violin that they’ll want to play. Some older kids might be ready for a full-sized violin. 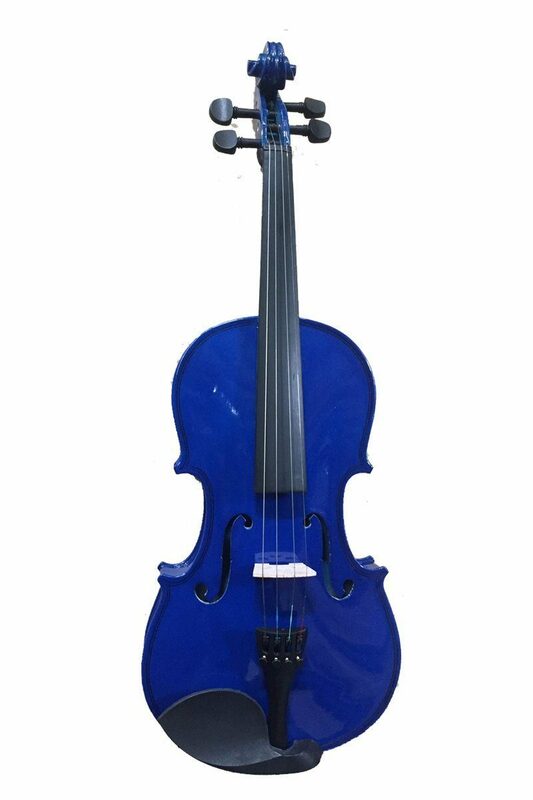 There are violins that come with full instructional videos on how to play and even violins made especially for lefties. You can find violins of all sizes for anyone to start learning. This category includes everything from clarinets to recorders. Most wind instruments have a reed of some sort to make noise, but those can be difficult for younger kids to learn. They won’t have the ability to control their breathing enough to play a reed instrument, but that’s no reason they can’t have fun with an age-appropriate version! Try simple things like whistles if your toddler really wants to blow into something. Plus, there are a lot of toy wind instruments out there, like this saxophone. Or this one! There are even toy clarinets, too. In this age group, the easiest instrument to actually learn how to play is the recorder. There are a lot of different ones available, too. Some are brightly colored plastic and others have beautiful wood finishes. 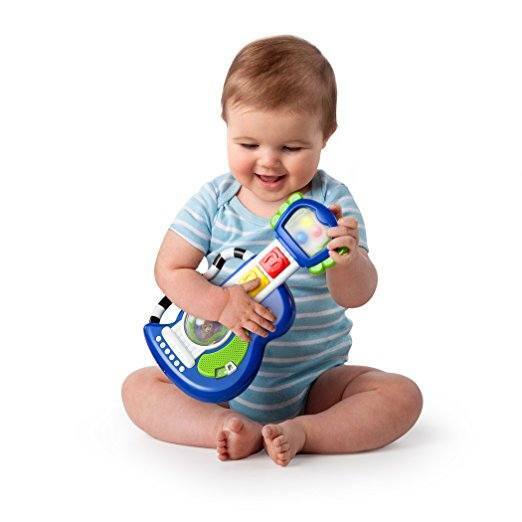 Don’t let the recorder fool you—it’s a real instrument, not a toy! Of course, when your child is ready, it’s time to move up to the real thing, just like the big kids. This is a great age range to introduce reed instruments, too. Reed instruments require a little more attention and care and children in this age bracket are up to the challenge. Why not give the clarinet a try? You can even get one in your child’s favorite color which just might encourage him to practice more! 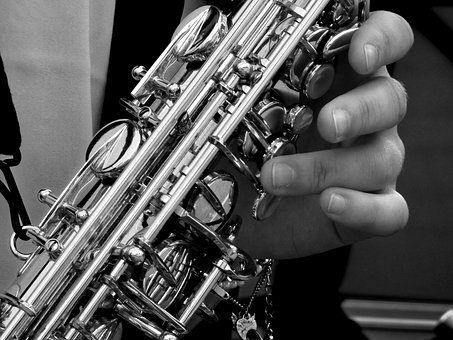 A saxophone is really similar to the clarinet in technique, too, though it looks and sounds much different. 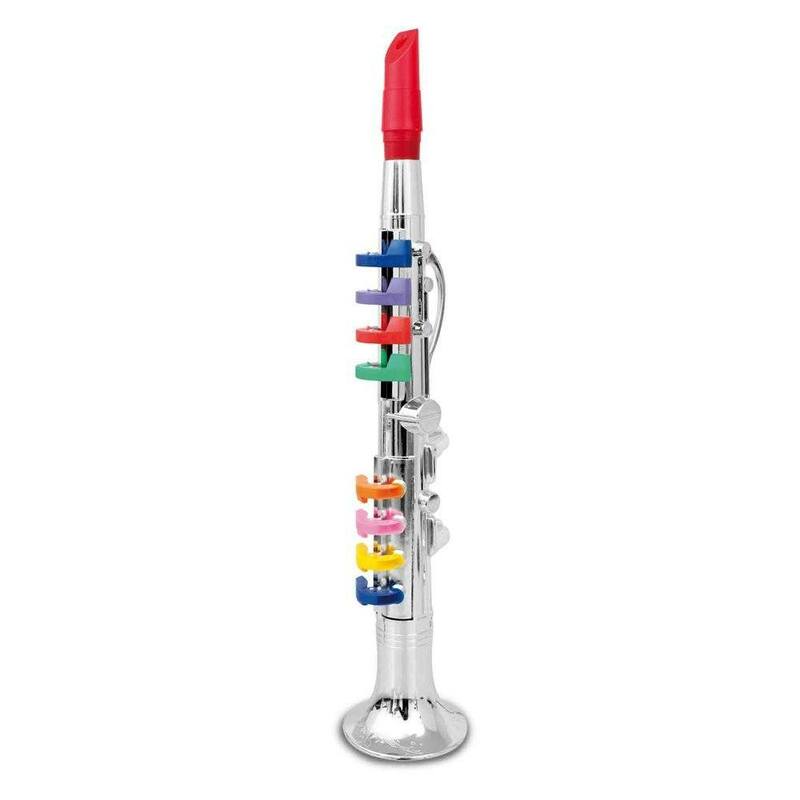 Another great woodwind to try at this age is the flute, which you can also find in a wide range of fun colors. ​The most popular brass instrument is a trumpet, though French horns, trombones, and tubas all fit into this category, too. 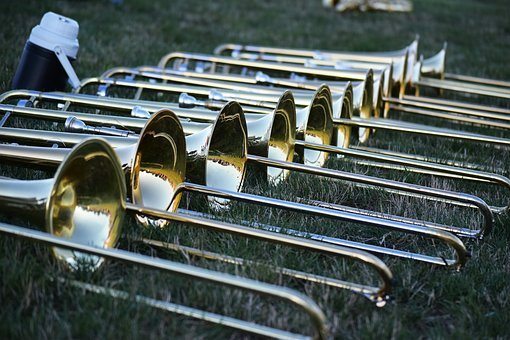 Just like winds, brass instruments use air to make a sound. The difference is that rather than a reed, brass instruments use the vibrations of the player’s lips. 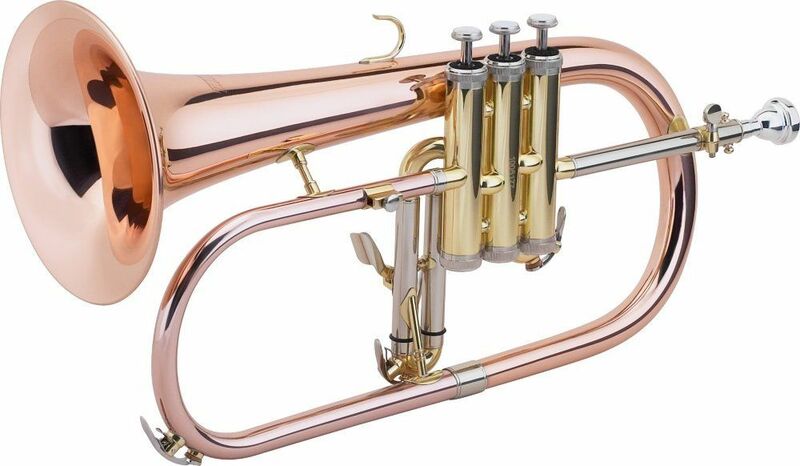 Brass instruments can also be a little hard for younger children to play because there is a lot of technique involved; however, there are versions of these instruments that even the youngest musician will love. 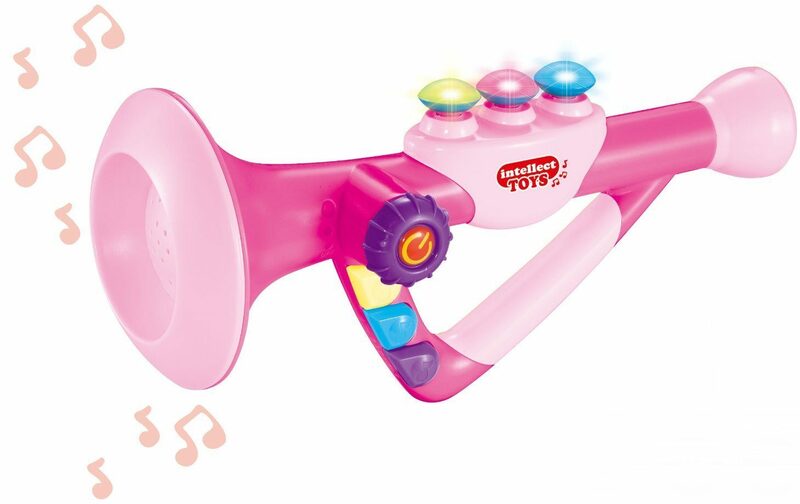 Little ones will love trumpet toys that light up and play a variety of songs and tones. If you want to give your kid an experience that’s just a little more realistic, you can even find some that they can blow into. There are pink ones available, too, if you prefer! Kids that are a little older can begin practising using the finger buttons and blowing into a brass instrument. 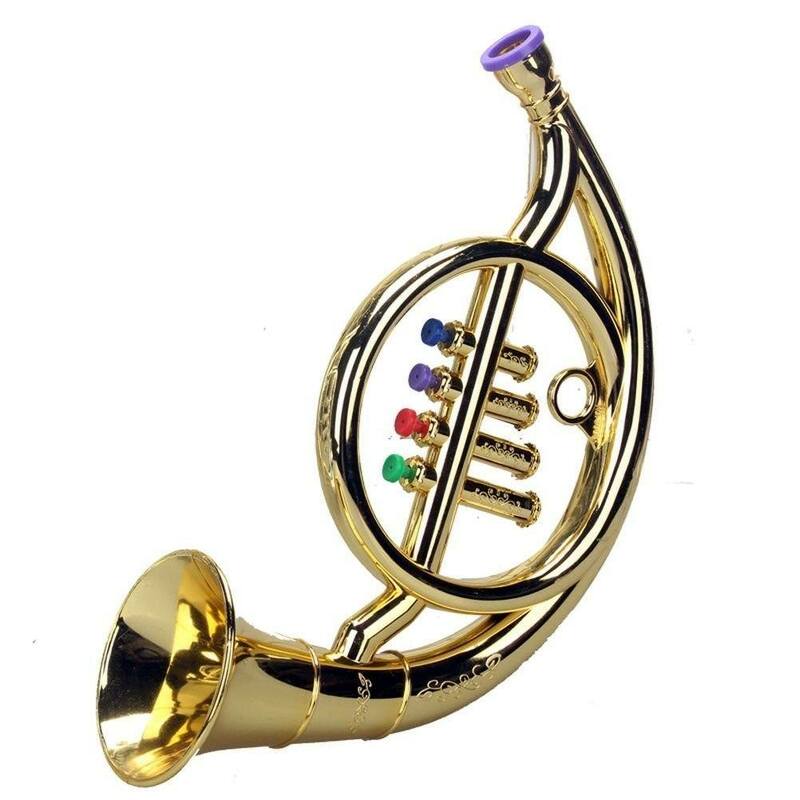 If your child wants to try something different, how about a French horn? Kids on the youngest side of this age range might not be able to figure out exactly how to play these instruments yet, but as they get older they’ll soon be able to figure it out. Then, they can progress to the real thing. Older kids that are actually interested in learning how to play can definitely handle the real thing when they’re around this age. For example, there is a wide range of trumpets available. Their prices go from the high to the middle to t﻿he low end of the price range. If you’re concerned about care and fundamentals of playing the trumpet, there are even kits available that come with everything your child needs. There are also French horns that range from a significant investment to a ba﻿rgain. And don’t forget the out of the ordinary brass instruments: flugelhorns, euphoniums, and even the bugle.